Hey everyone. 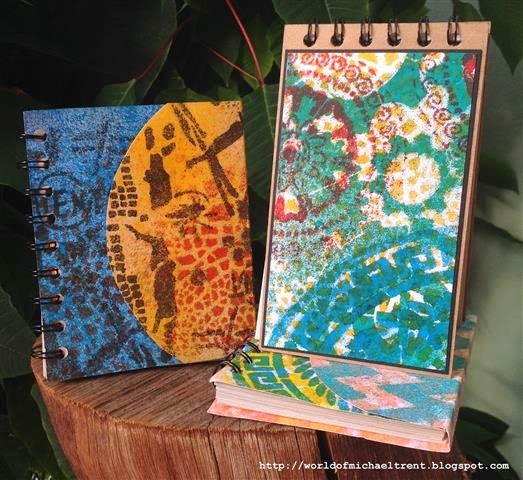 I have a new video tutorial on how to make the above mini notebook - over at the StencilGirl blog...StencilGirl Talk. Hope you can stop by and check it out. Just click on the photo above, or the link below!! 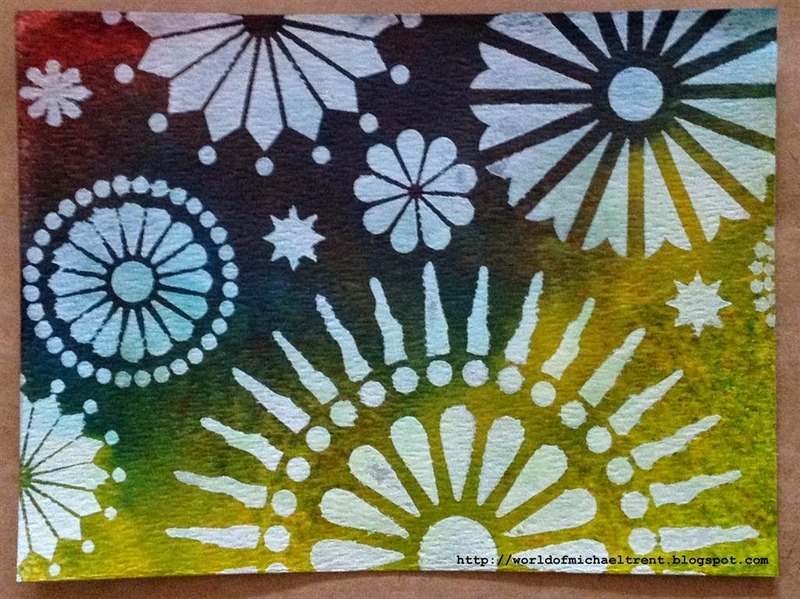 I am one of the moderators on the StencilGirl Club Facebook Page and one of the members asked a question last night about how to seal a project in which she had used Dylusions sprays, some acrylic paints and some pens. Well, let me say right here - I am NOT an artist. Well, not a trained one. I never remember what to use with what and am always making tests on small pieces of paper to see what happens. So, why not do a test this time? To be honest, this was a lot of fun for me. I tend to always grab the same mediums. Tonight I just played! I put paints on top of mod podge. I used distress inks over molding paste. It was so much to just play and see what happens. And I really LOVE how these pieces came out. 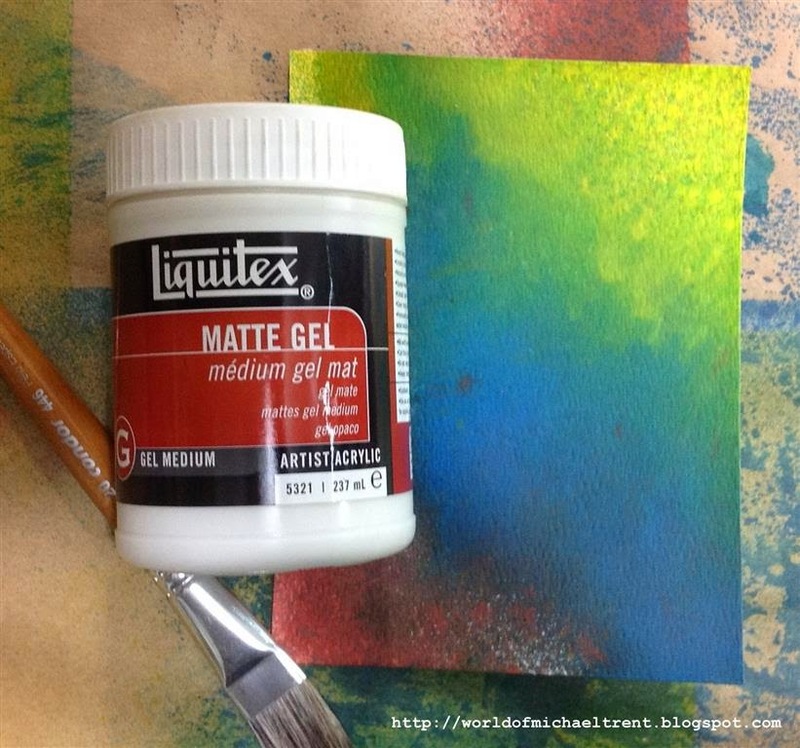 First thing I did was take a sheet of watercolor paper, which I did NOT gesso, and sprayed it with some Dylusions sprays (London Blue, Postbox Red, Pure Sunshine, and Fresh Lime - if you need to know). I removed any excess with a paper towel and then dried with a Ranger heat gun. Then I cut it into 4 equal pieces. 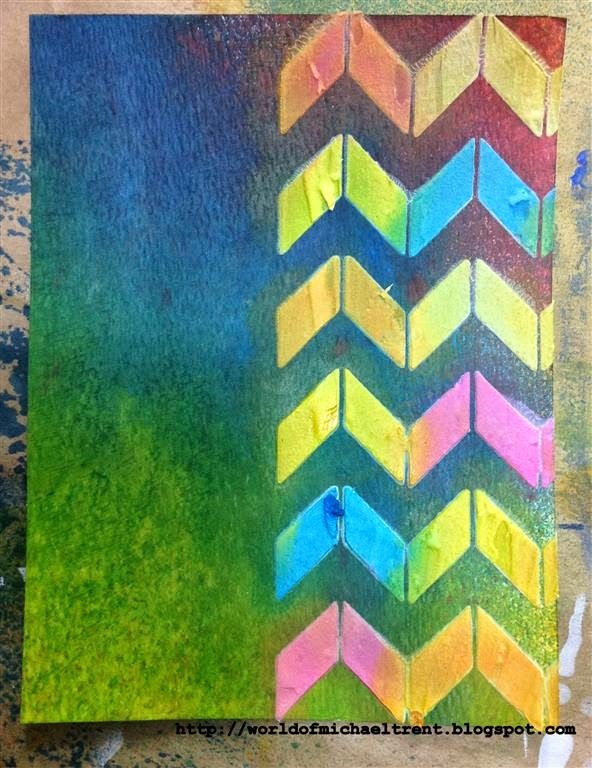 Piece 1 - First I applied a layer of Matte Gel Medium by Liquitex and heat set. The colors from the Dylusions sprays did not run. Then I used Chevron Set No. 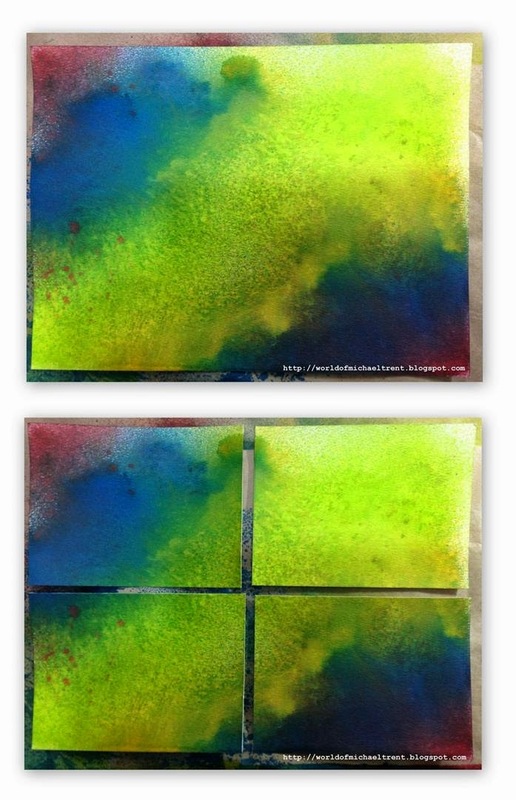 3 (L245), by Andrew Borloz for StencilGirl, with molding paste and heat set. 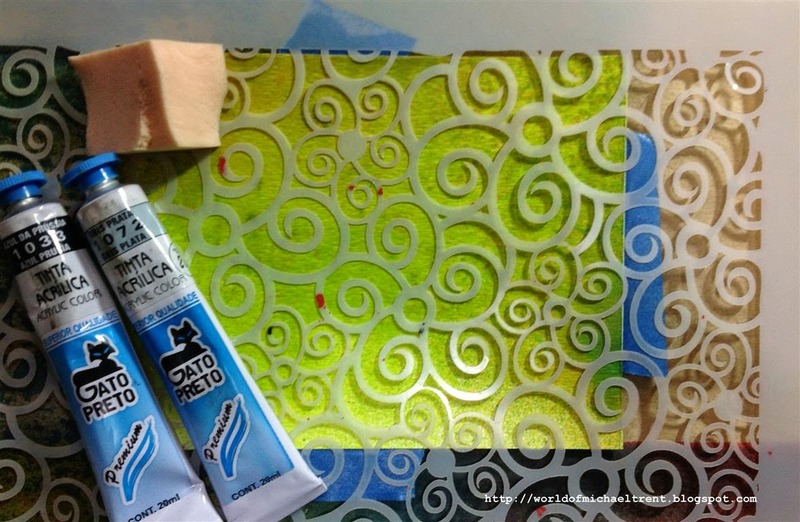 Then I went back and put the stencil back over the molding paste and applied Distress Inks with a dauber (Spiced Marmalade, Salty Ocean, Mustard Seed, and Picked Raspberry - if you want to know). Then I heat set that. I also outlined the Chevrons with a white Signo pen and stamped the phrase in Versafine Onyx Black from a set by Leave Memories that I found in my stash. This set is so old that I can't even find the company anymore online. Sad. I LOVE how this came out and hope that the paints do not run or smear when I apply a seal coat. Piece 3 - I did not seal the Dylusions sprays. I have to admit - I love how the stencil design looks with the Titanium White in Piece 2, above. 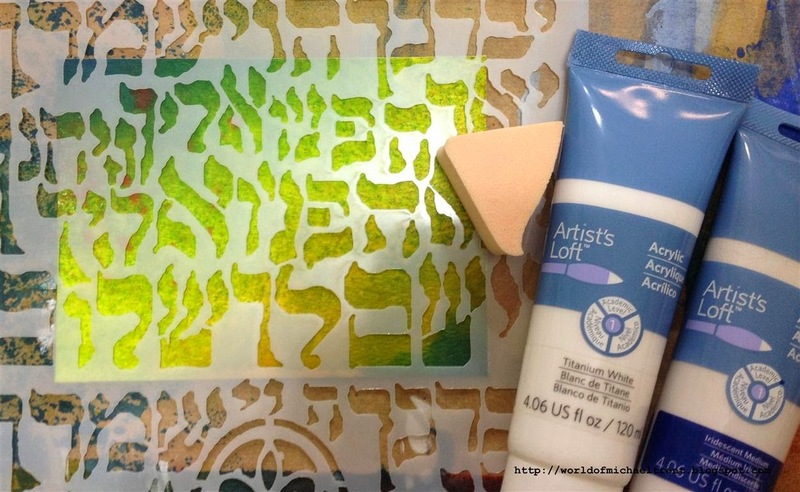 So I did the same for this piece but used the Hebrew Calligraphy Hamsa Stencil by Jessica Sporn for StencilGirl. 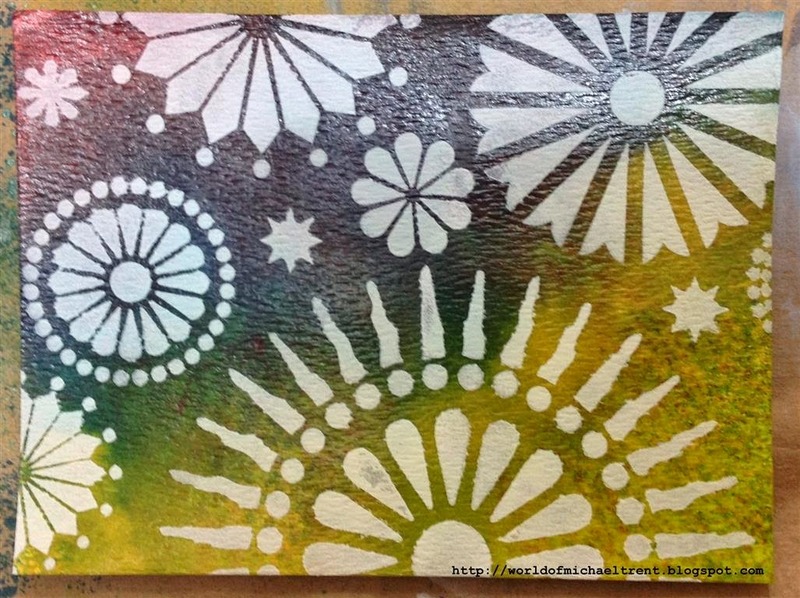 I also mixed the white paint with an Iridescent Medium, also by Artist's Loft. Piece 4 - Again, I did not seal the Dylusions sprays. 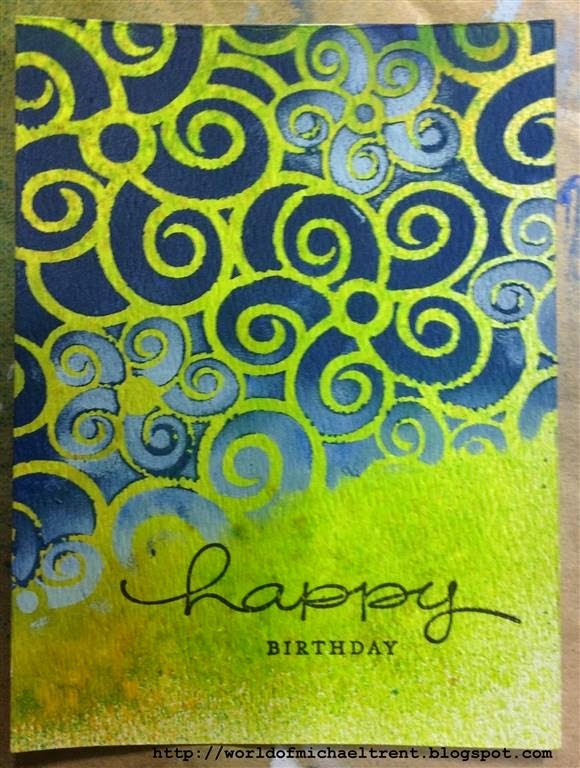 I adhered the Swirly Flower stencil, by June Pfaff Daley for StencilGirl, to the card front with painter's tape on the back. Then applied some Prussian Blue acrylic paint through the stencil with a makeup sponge. 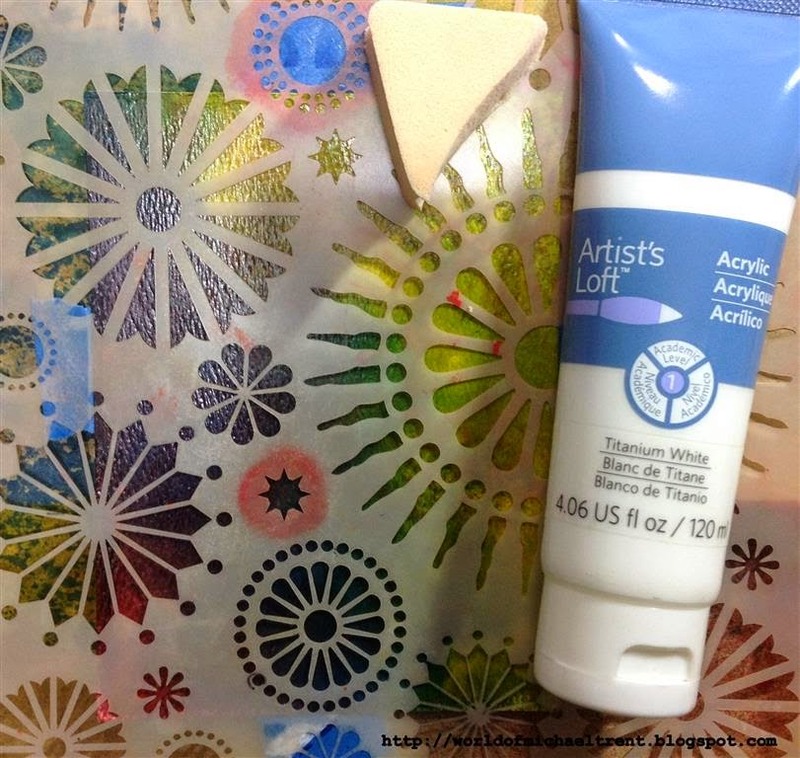 When dry, I applied some silver acrylic paint over the cobalt blue in certain places. Heat set both times. The paints are artist grade from a Brasilian company. 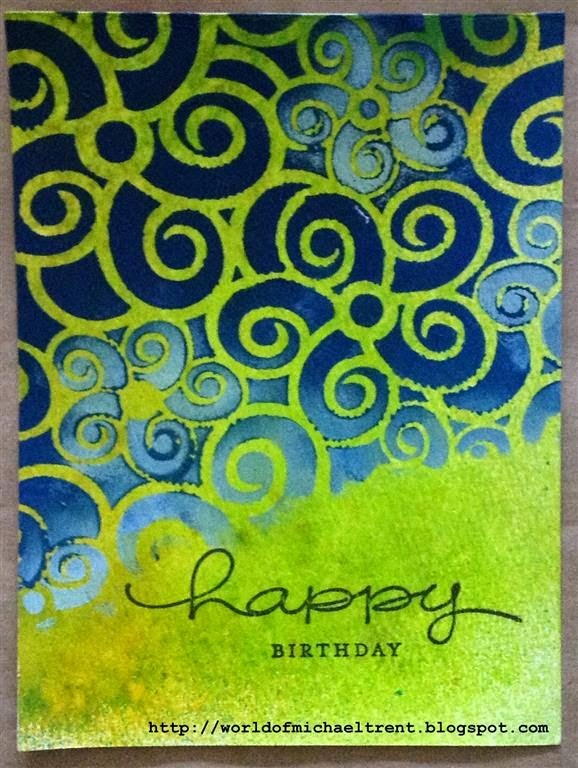 Then I stamped Happy Birthday (Happy Everything by Stampin Up), in Versafine Onyx Black. Now for the sealing. I have used beeswax to seal a piece here and there but, normally, I don't seal my pieces. Since I would only seal with a gel medium, I applied a coat to each piece. I am assuming that the first two pieces, since I applied a seal over the Dylusions sprays before applying the paint, that nothing is going to run. I have no idea what is going to happen for Piece 3 or 4 since I did NOT apply a seal on the Dylusions before applying the paints. (Hoping they do not run since I really like these two pieces and want to use them for cards today. LOL). 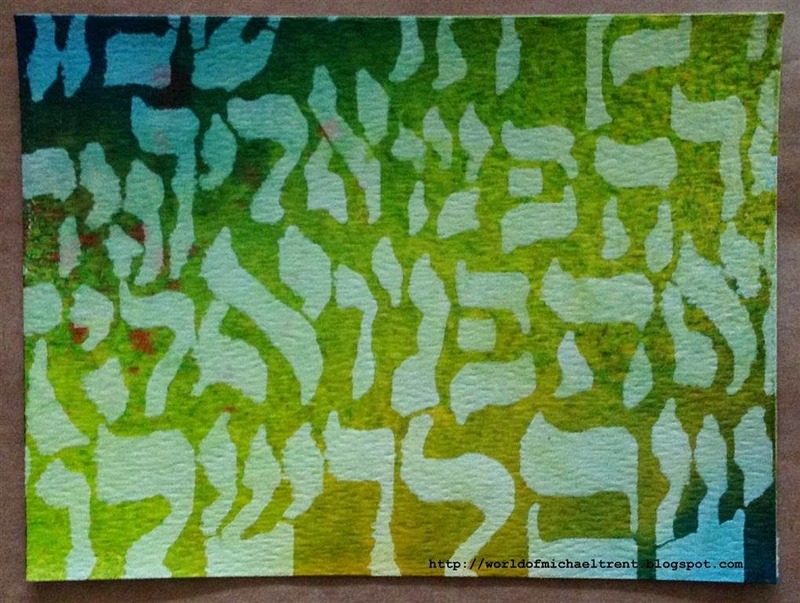 Piece 1 - I assumed there would be no bleeding of the Dylusions inks since I did put a coat of gel medium. 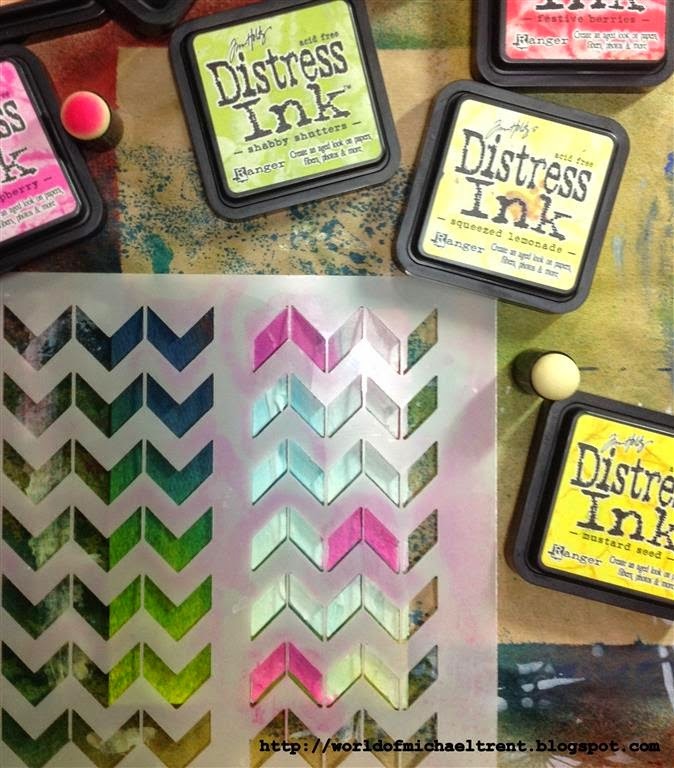 There was some bleeding of the distress inks, but only minor, and I had a feeling they would. 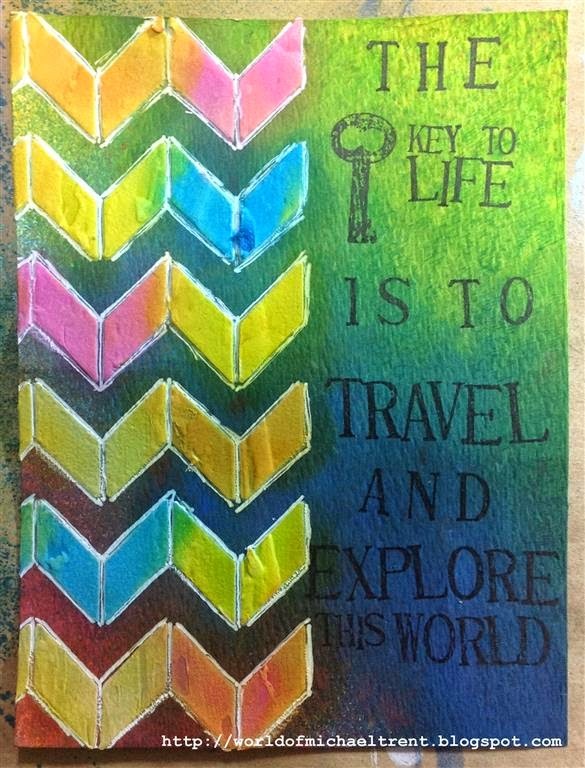 But, because I used a bunch of different colors, it did not bother me in the end. Piece 2 - Again, there was a coat of Mod Podge over the Dylusions and they did not bleed. There was also no bleeding of the white acrylic paint. The only issue was that I forgot to wash my brush after the coat on Piece 1 and some of the distress colors did transfer to the white paint sections. The white is not as bright as before. 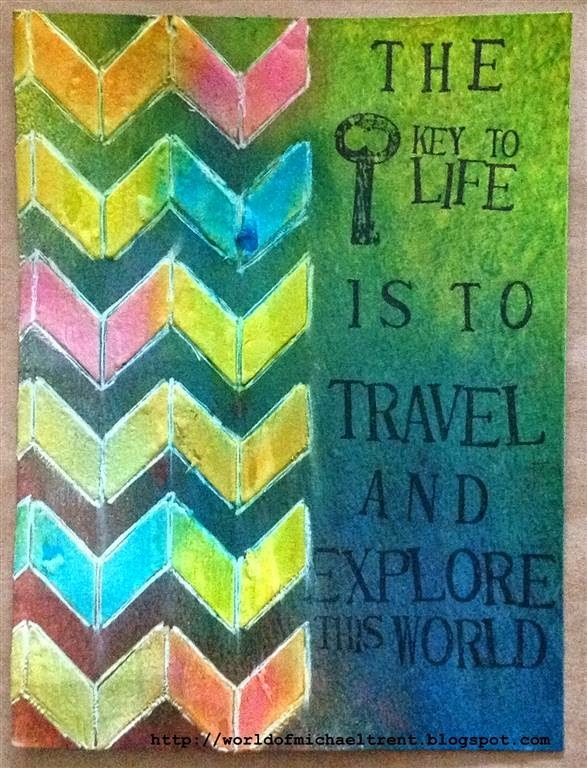 Piece 3 - I did not have any bleeding of the Dylusions or of the acrylic paints. Interesting - since I did not seal the Dylusions after I used them and Ranger claims not to have any type of seal for them. Piece 4 - As with Piece 3 - no bleeding of the Dylusions or of the paints. So happy as I really love how this came out!! This was fun. I forced myself to play with stuff I have - but never use. But I will be using them more now. As for the results, remember, I am not a schooled artist, but, if they worked for me, they should work for you. 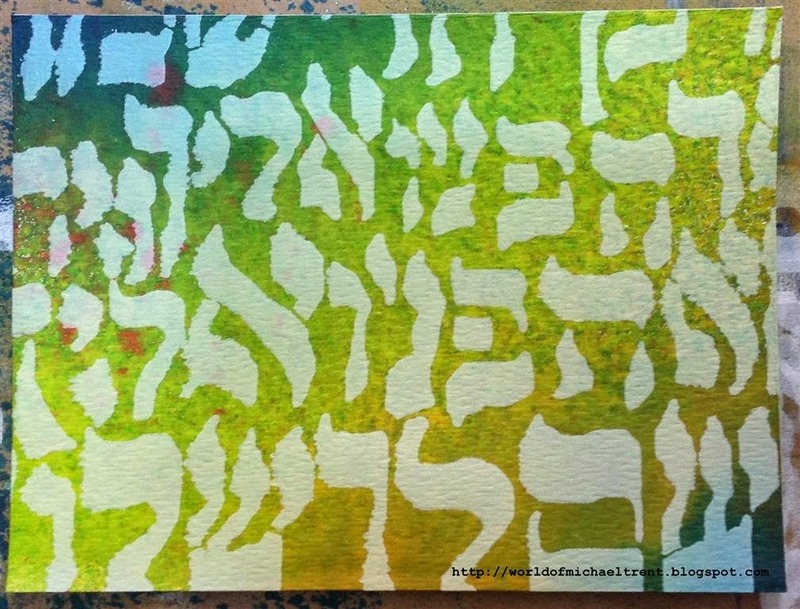 When in doubt, take a small piece of the paper you are working on, cover it with small amounts of the mediums you are working with, in the order you are working with them, and see if this works - BEFORE you start to apply it to your final piece. Will post pics of the final cards once done. I hope this was helpful to someone. Please leave comments if you wish! From what I have been told, when the country of Brasil was owned by the king of Portugal, he granted huge areas of the country to specific families. Ya know, those families with lots and lots of money that would do anything for the King. Well, our town, Cosmopolis, is what it is today because the Nogueira family. The Nogueira family formed a sugar cane mill on March 2, 1898 called the Usina Ester. The Mill is one of the oldest Sugar Mills in the State of Sao Paulo and is still in operation today, making both sugar and ethanol for Brasil. The Mill sits on the edges of our town. Well, back in the day, most of the employees lived on the same land as the mill, in row houses called Colonys. The Colonies were owned by the Mill and the employees lived there for free, just having to pay for some food and clothing, which were bought at the Cooperative in the Mill. 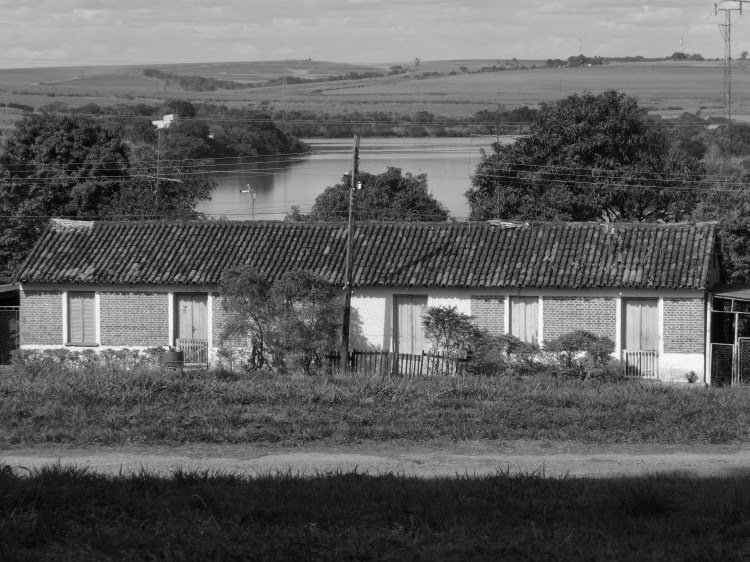 Ruy, my partner, lived in a Colony until he was 8 years old, when his family moved to Sao Paulo city. One of the "Colonies" on the Usina Ester. is grandparents before they moved to Sao Paulo. Since the employees were not paying rent, they saved as much of their income as possible and when they had enough money, they would buy a lot of land in Cosmopolis, build a home on the lot, and then leave the Usina to live in town. A few weeks ago Ruy and I were driving through the Usina and found one of these Colonials in ruins. It seems that, although there are still a few Colonials still being used on the Usina, most of the families have left and now live in town, so the older Colonials are being torn down to make room for more sugar cane plants to be grown. They are Below are some of the photos of what is left. This is what is left of the chicken coop. While walking into the back to get photos of the chicken coop, I saw this section of the fence with a very cool painting on the wood pieces. We asked some guys who were taking the houses apart if this was going to be thrown out. They said yes and, if we had tools, we could take it. So, some snips later, the pieces were in the car and are now in the house. to take also but it was covered in termites. The section of the fence with the art before I snipped the wires. Going to put some braces behind the pieces (after I get all the termites gone) and it will hang in the garden. Hello everyone. There is an amazing auction going on - RIGHT NOW - HERE - to raise funds for GirlRising, which is a global campaign for girls' education. Girl Rising unites girls, women, boys and men who believe every girl has the right to go to school and the right to reach her full potential. And this is just a small part of the list. I hope you can check out the auction. The prices are beyond reasonable!! You can also make a donation, if you want. They were hoping to raise $1,000 but have already doubled that amount and the amount of money raised continues to grow. Please share this on all of your social media platforms and get the word out!! 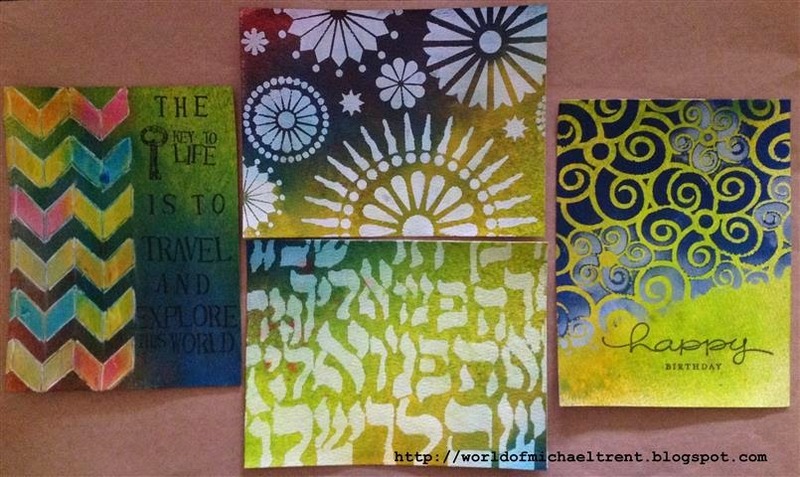 On the StencilGirl Blog today is my post on making Easy Peasy Note Cards! 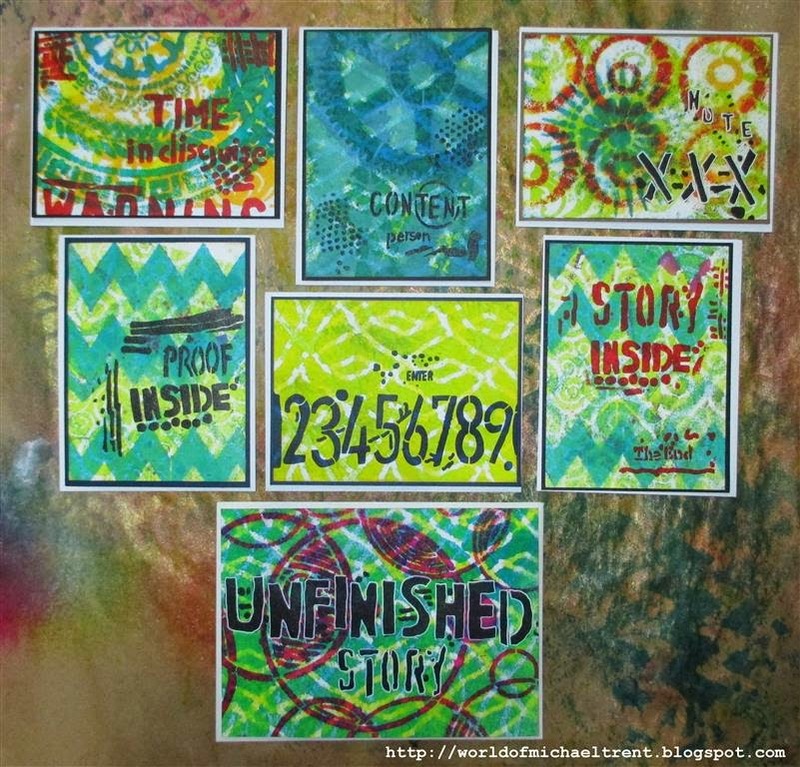 I used some of my left over Mixed Media papers from my Mini Album with Seth Apter's stencils. Just click on the photo above or click HERE.